Although you may not be able to recollect it with vivid clarity, chances are the first kind accessory to call your jewelry box home as a child were brightly hued, sparkling necklaces. And it’s not exactly difficult to comprehend why. A beaded, beautiful necklace was probably the most memorable jewelry piece you watched your mother dressing herself with as she prepped herself in front of the mirror. And it was likely the most visible too. Everywhere she went and no matter what the outfit, whether it was a classic strand of pearls or a multicolored pallet, a sense of timeless elegance was continually on display. Fast forward to today, and the same allure associated with necklaces that mesmerized us as curious children continues to captivate us long into adulthood. Necklaces, whether they’re intricately beaded or studded with a string of luminous gems, have the unique ability to inject and emit feminine charm and bold expression within a single piece. And what’s more, necklaces draw our gaze to one of the more sensually flattering parts to the body: the neck and collarbone. A perfectly placed necklace holds the ability to both frame a figure and flatter a feature. While the enticing nature of necklaces transcends a breadth of cultures, eras and emotions, the timeless pieces contained within SilverTribe’s vividly lustrous necklace collection are injected with a unique inspiration. 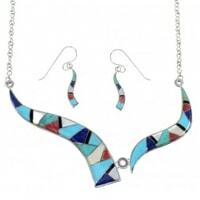 Paying homage to our artist’s unique backgrounds and styles, SilverTribe’s necklace pieces come crafted with a unique southwest flair, encompassing the kinds of breathtaking colors and designs associated with region. 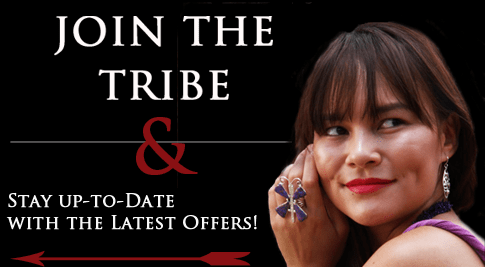 And now, SilverTribe invites you to explore our mesmerizing array of beaded, chain, rope and choker necklaces from our timeless sterling silver jewelry vaults. There’s no doubting the enigmatic pull a perfectly placed necklace can have on curious onlookers. 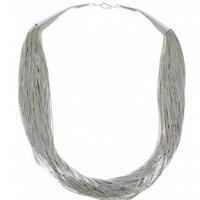 And while the luminous luster emanating from them most certainly plays a part in that allure, the shape and motion a necklace complements that draw as well. The necklaces contained within SilverTribe’s jewelry vaults come in a series of distinct shapes, flattering for virtually any kind of figure, personal style preference, or bold personality. 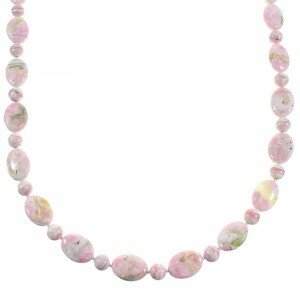 Matinee Necklaces – Matinee necklaces extend roughly 22 – 24 inches, and tend to form a single strand at the top of the cleavage. These kinds of strands tend to be universally flattering. 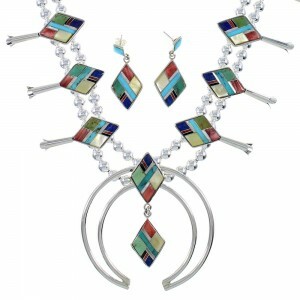 Opera Necklaces – Opera necklaces are typically 30 – 35 inches in length, or just a touch longer than a matinee strand. 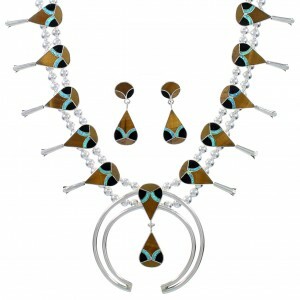 And like the matinee, opera necklaces tend to flatter most all figures and frames, all while accentuating the neck. 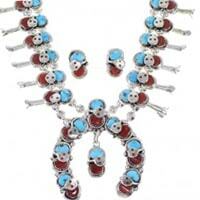 Bib Necklaces – Resembling a child’s bib in shape, a bib necklace tends to relay a certain amount of regality. 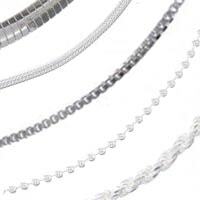 Lariat Necklaces – Lariat necklaces, similar to a rope or chain piece, tend to have no clasp and are capable of being draped, wrapped or knotted, and are flattering on most all figures. Lariats are typically best worn with a plain tee or v-neck. Rope Necklaces – Like lariat necklaces, rope necklaces can be doubled, knotted or wrapped several ways, but contain a clasp to hold the piece together. Looks best when paired with a plain tee or plunging neckline. 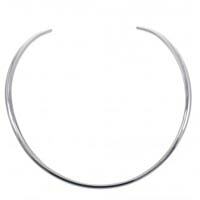 Chokers – At 14 – 16 inches in length, chokers tend to hug the neck quite snugly. 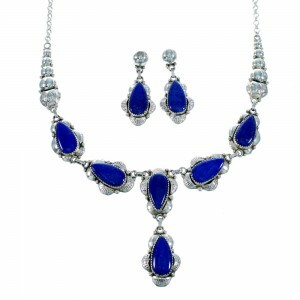 This kind of jewelry is best when paired with formal attire. 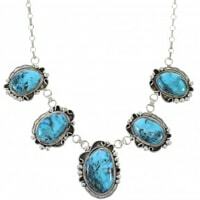 Squash Blossom Necklaces – Squash blossom necklaces are a true centerpiece of southwestern, Native American-inspired style and tradition. Containing an intricate series of stunning sterling silver and precious, earthy gems, these jewelry pieces – when completed with earrings – are a true statement-maker. We urge you to explore all the kinds of intricately designed, unique pieces contained within our necklace vaults. Although the necklaces contained within SilverTribe’s vaults are undoubtedly classic and crafted with regality, what makes our collection of timeless pieces so unique is our incorporation of distinct southwest-inspired gems and jewels. 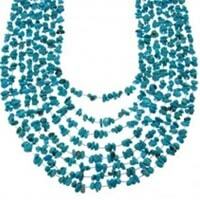 Turquoise has become a true fashion staple in recent years. 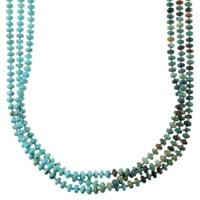 Popularized by a growing number of style-conscious red carpet starlets, adorning turquoise jewelry – especially in the form of a necklace – has been a simple way of expressing a somewhat earthy, yet intricately stunning style. But while the stone is undoubtedly captivating based on aesthetics alone, turquoise is rooted in a deep, contextual history within the desert landscape. 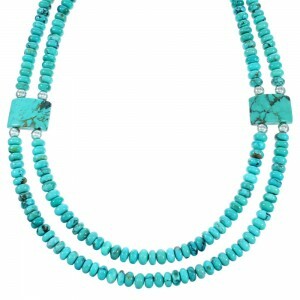 Artfully crafted by a number of Native American tribes indigenous to the American southwest, turquoise has been used in traditional religious ceremonies as a means of protection, meditative healing, and spiritual power. 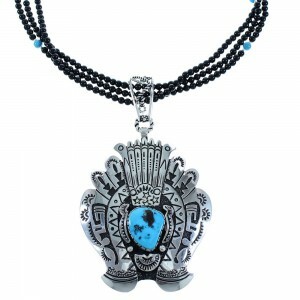 A turquoise necklace draped around the neck can signify both a curious and introspective insight, as well as the power to protect and heal. While a sizable majority of the stones contained within SilverTribe’s timeless vaults are mined from deep within the earth’s crevices, coral tends to be associated with a somewhat more organic history. Extracted from the rich marine sea beds, coral is the skeletal remains of the subsequent plant. However, not all coral is prime for picking, as divers must tirelessly sort through several beds in effort of obtaining the perfectly-colored piece. 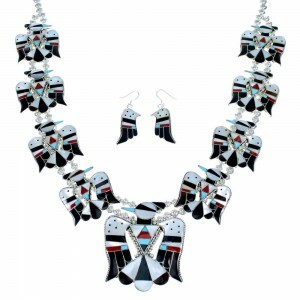 While the warm aquatic waters of the Caribbean are quite a ways away from the chalky desert landscape encompassing the southwest canyons, coral remains an integral component to Native American and southwest-inspired jewelry pieces. Said to contain tremendous healing and energy-inducing powers, coral – besides its vastly rich allure – contains a great deal of strength. Opal, one of the more curiously translucent hues contained within SilverTribe’s vaults, has no shortage of awe associated with it. The stone can encompass an enormous array of color schemes, from multicolored pallets of rainbow shades to shimmery silvers and whimsical whites. While the stone is undoubtedly stunning, opal is said to contain a plethora of healing powers. Owners of opal gems have reported alleviated depression, anger and angst, as well as the emotional healing associated with finding love. Browse through our collections of timeless turquoise, coral, opal and various other dazzling hues in our timeless jewelry vaults. From bolos and belt buckles to rings, bracelets, earrings and watches, the combinations of design and color scheme are virtually endless. All of the necklaces contained within SilverTribe’s timeless inventories are enigmatically enticing by their looks and rich, southwest back story. However, we at SilverTribe believe that the most uniquely stunning kinds of jewelry pieces should never come packaged with a sky-high price tag. 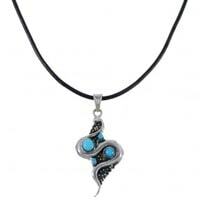 All of our valued customers receive FREE shipping on any piece of jewelry on the entire site. And what’s more, you can become eligible for exclusive sales, promotional offers, giveaways and style tips with just a few clicks of the mouse. Be sure to sign up for our FREE email list today by visiting SilverTribe.com. While a necklace tends to be one of the more central pieces contained within a jewelry collection, it shouldn’t be the last. Be sure to explore our massive inventories of earrings, rings, pendants, pins, watches, bracelets, bolos, buckles and more.